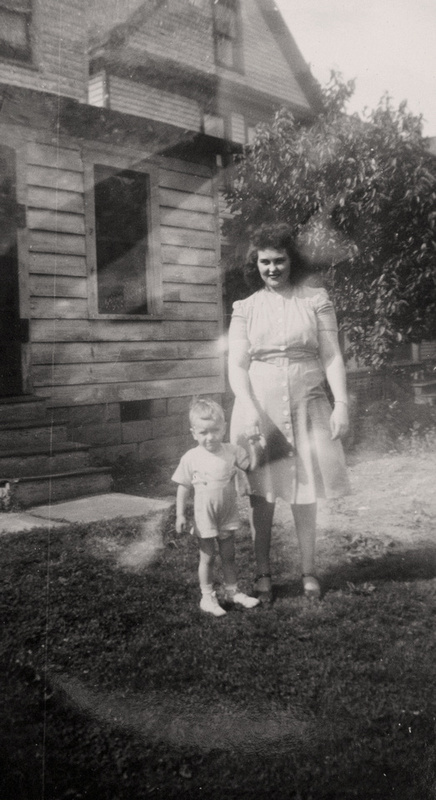 Mary Eugenia McDonald photographed with her oldest son James Anthony Murosky in the mid 1940's. Depending on the date the photograph was taken Mary Eugenia would mostly likely have been between 23 and 25 years old. James Arthur would likely have been between 2 and 3 years old. The location of the photograph is unknown. This photograph was included in the Helen Tillie Bukowski Collection. Helen Tillie Bukowski would have been James Arthur's paternal grandmother. Mary Eugenia McDonald was born January 22, 1922 in Strattanville, Clarion, Pennsylvania. She was the daughter of Loraine Anthony McDonald and Frances Philomena Selker. James Arthur Murosky was born October 8, 1942 in Erie, Erie County, Pennsylvania. This photograph is from the Helen Tillie Bukowski Collection. Photographer Unknown. Editing and digital restoration by Michelle M. Murosky. Mary Eugenia McDonald is my paternal grandmother. James Arthur Murosky is my Uncle.